This chapter turns to another significant post-Occupy Central issue concerning politics and university governance—the intervarsity campaign for ending the role of the Beijing-appointed HKSARCE as ex-officio chancellor of all public universities in Hong Kong. The chapter shows that the student- and staff-initiated intervarsity abolition movement extended their pursuit of greater democracy from the political arena to higher education. Staff and students questioned the HKSARCE’s dual roles as city head and university chancellor, his/her unchecked appointment power, his/her appointees’ ties to local and central authorities, and the dominance of external members in council membership across public universities. 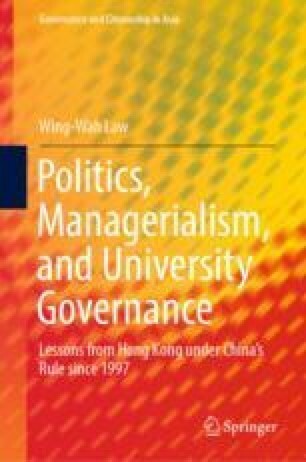 While they used different strategies to force university councils and the government to review the HKSARCE’s role in university governance and amend university ordinances, the universities remained highly reluctant to change the chancellor system and the managerial model of governance dominated by external members. Chan, M. K. (2016, January 11). Daxue Yingyi Jiaoxue Weiben, Bushi Zhengzhi Jueli De Changdi [University should focus on teaching, not a venue of political wrestling]. Retrieved from https://zh-hk.facebook.com/twscmk/. Cheng, K. (2015, September 30). Explainer: The HKU Council pro-vice-chancellor debacle. Hong Kong Free Press. Retrieved from https://www.hongkongfp.com/2015/09/30/explainer-hku-council-rejects-johannes-chan-appointment-to-pro-vice-chancellor/. Cheung, A. (2015, November 24). Referendum results show HKU students’ rejection of ‘King Arthur’. The Lion Post. Retrieved from http://thelionpost.com/2015/11/24/referendum-results-show-hku-students-rejection-of-king-arthur/. China Daily Reporter. (2016, February 23). Lingnan University cancels meeting after fracas. Retrieved from http://www.chinadailyasia.com/hknews/2016-02/23/content_15388605.html. Hong Kong Government. (2018). University of Hong Kong Ordinance (Chapter 1053). Gazette, 22(50). https://www.gld.gov.hk/egazette/pdf/20182250/egn201822509182.pdf. Hong Kong University Students’ Union, Academic Staff Association of The University of Hong Kong, & HKU Alumni Concern Group. (2019, January 1). Change now or never: Joint appeal to the Chancellor, the Court and the Council for Amendments to the Statutes of the University of Hong Kong. Retrieved from https://www.facebook.com/hkusupage/posts/2049742305084257. Su, X. (2018, October 14). Professor Rosie young wins place on University of Hong Kong committee as beaten rival bemoans lack of student voice in search for new chairman. South China Morning Post. Retrieved from https://www.scmp.com/news/hong-kong/education/article/2168409/professor-rosie-young-wins-place-university-hong-kong.